No, it’s not cheap. But top-of-the-range laminated Gore-Tex never will be. And it’s around half the price of some other gear using similar technology. Textiles generally have a ‘drop-liner’ – a waterproof, breathable membrane hanging separately to the outer shell, whereas a laminated membrane is bonded to the main fabric. This is a more expensive construction method, as all the seams have to be very carefully taped. 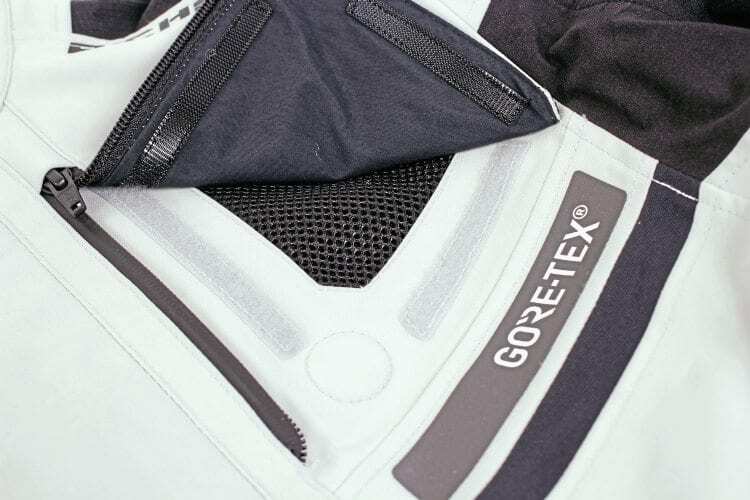 Plus, if Gore-Tex is used, a number of criteria, including the build quality of the garment, have to be met before a licence is provided. That licence appears to be well earned here, the Atlantic jacket and trousers are well made with some brilliant features: abrasion-resistant Armacor on the key impact zones, 3M reflective panels, sealed front and rear vents, chunky YKK zips (that are also water-resistant where necessary), 11 pockets, D30 armour (including a back-protector), and a thermal liner that can be zipped out and worn on its own. D30 armour is fitted throughout the kit. 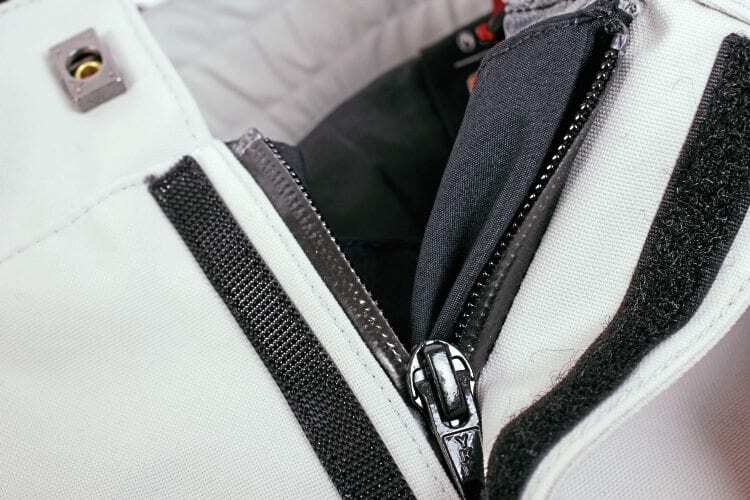 The front zip’s storm flap design appears to trap water well before it can make its way to the weak-point of any jacket – the main zip – and adjusters on the jacket’s arms and waist, plus the trousers’ waist means I was able to get a very good fit. 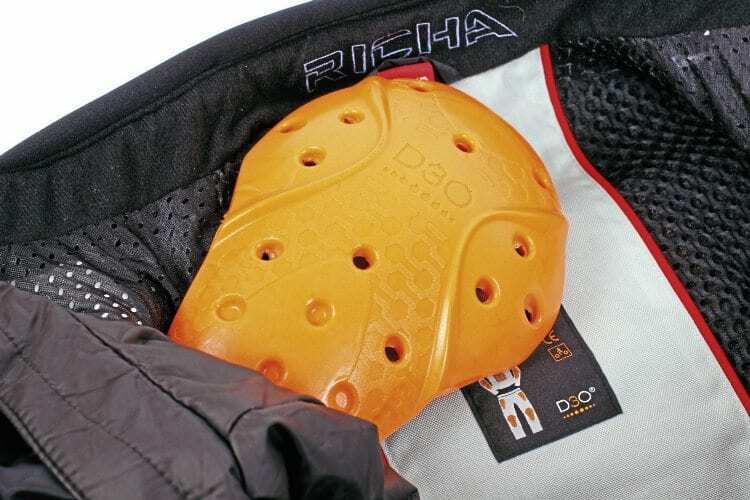 A storm flap protects the main zip well. I’ve only been using it through the winter, so I can’t yet comment on how hot it’ll be in the summer, but the good-sized mesh chest vents (with neat magnetic retainers) should allow plenty of air to flow through. In the coldest of weather, you still need to layer up, or I use a heated vest, but that’s not unusual. At 9°C, in just a T-shirt, I was fine for an hour and a quarter, just starting to feel the cold when I stopped for directions 60 minutes into the ride. The chest vents are held open with magnetic fasteners. Being new, water beads very well on the outer, but all garments need to be kept clean to work at their best, as the outer is treated with a DWR (Durable Water Repellent) coating to stop it from ‘wetting out’. This is when the outer becomes so soaked in water that it doesn’t allow the membrane to breathe properly, making you damp with sweat. The disadvantage of a laminated construction is that it can feel stiff. While the Atlantic manages this well, I do find that it tends to ruck up at the front, pressing on my chest. 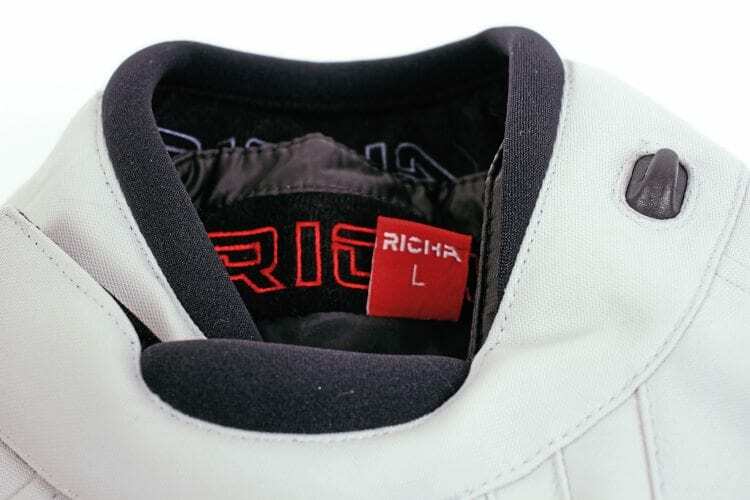 The overall construction, however, is solid feeling, giving confidence in the build quality of a textile system that Richa should be proud of. 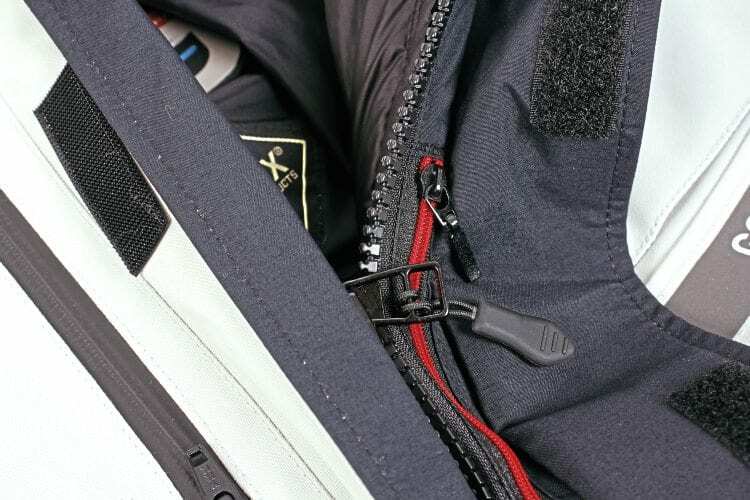 The trousers’ fly has a quality waterproof zip. There are niggles – the jacket’s thermal liner is comfortable, but it hangs about 4in lower than the zip that joins to the trousers. Not only does this make it more awkward to join the two, it means the liner rucks up all the way around once you’re zipped together. 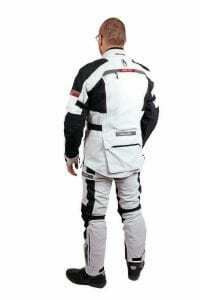 Some basic braces are supplied with the trousers if you don’t want to zip them together. In 75 minutes of heavy rain, I only got damp on the tops of my shoulders, where water had found its way down my waterproof KTM neck tube. The Atlantic’s neck won’t go tight enough to seal fully around my bare throat, so I’ll need to make sure I try to position my neck tube better next time. I struggled to get a good seal at the neck. The jacket’s cuffs work well with my Weiss waterproof gloves, which have a lining to go under the cuff, then an elasticated outer that you put on the outside. However, my Keis heated gloves, which like most others should be tucked under the jacket’s cuff for maximum water proofing, were a bit tricky to get in. 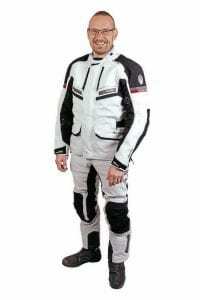 Equally, the bottoms of the trousers are a snug fit over my TCX touring boots. Once in place though, you’re well sealed and comfy. 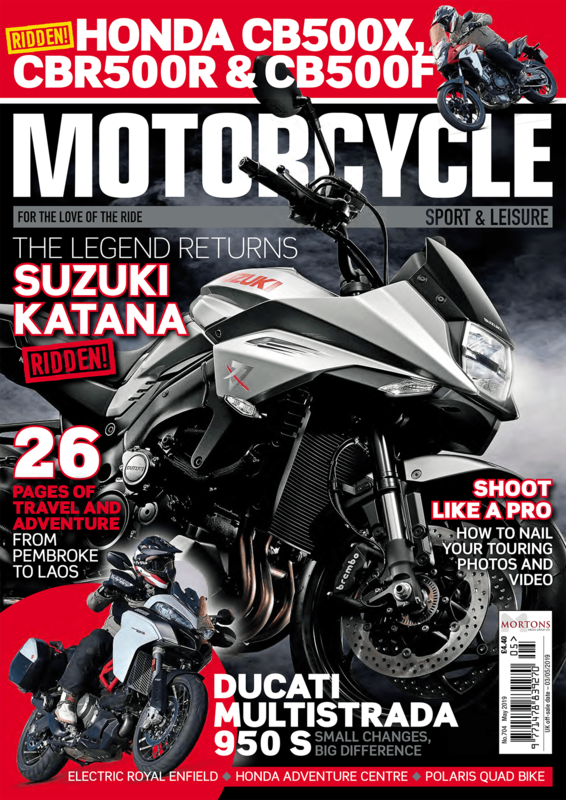 Next Post:MSL July 2018 out now!